When five strangers wake up locked in what seems like a bunker, they realize a sick mind has thrown them together with a twisted purpose (is you will sinking into your Saw shoes?). 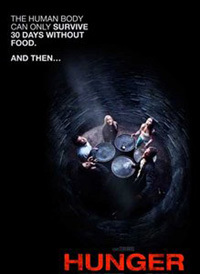 They have enough water, but no food... just a scalpel. With their different personality types laid out, it's a matter of time before someone cracks. Sure this has a familiar ring to it, but the mastermind is not masked, but rather visible to the viewer as he studies the deteriorating captives on screens from his comfortable location, taking notes on their behaviour (flashbacks soon revealing his intension). Will they turn on each other? Gang up? Do nothing and starve to death? Many will get bored with this very soon, but it may be worth sitting it out to see if anyone survives and if they escape the grimy hole.